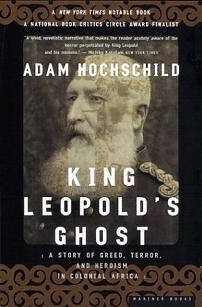 I completed Adam Hochschild’s detailed and searing King Leopold’s Ghost today, as indispensible a case study of the destructive rapine of European colonialism in Africa as has ever been printed. If you aren’t familiar, the book examines the single-minded imperial quest of King Leopold II of Belgium to acquire a profitable colony somewhere on the African continent and the horrible, nigh-genocidal results when he finds land that fits the bill: the region we now call the Congo. It’s a true, decades-spanning epic of hugely tragic proportions. Hochschild jumps from one mercurial historical player in the terrible saga to the next (sometimes to the detriment of his overall narrative arc, admittedly), sketching each vividly. We meet the titular king, an ambitious, imperious capitalist, forward-thinking wheedler and PR manipulator whose personal appetites match his economic ones. We meet his initial agent in the Congo, the famed explorer Henry Morton Stanley, an insecure, self-promoting chauvinist whose scorched-earth mapping campaign both opened up the region to Leopold’s exploitation and laid the foundations for the violent reign of terror that accompanied that exploitation. We also meet their public opponents: E.D. Morel, the English trading company employee who connected the dots concerning the forced labour system in the Congo Free State and vociferously lead an international campaign calling for its end, the first mass human rights movement in human history; Roger Casement, Morel’s friend and ally, a homosexual Irish patriot (no guesses as to what leads to his end) and British consul who witnessed countless atrocities in the Congo and campaigned eloquently against them; Joseph Conrad, the idealistic convert to British imperialism whose most enduring work Heart of Darkness was based directly on his experiences onboard a steamboat in the midst of Leopold’s Congo horror show; and others like energetic African-Americans George Washington Williams (a historian who first exposed the trade-driven terror in the territory) and William Sheppard (a Presbyterian missionary who provided damning evidence from the thick of the Congo). Hochschild apologizes for the lack of indigenous African voices, citing the lack of local records from the period of Leopold’s corporate colonization (properly 1885 to 1908, although exploitation began before and continued after). But indeed this is the failing of most post-colonial scholarship and literature that focuses on the enormous cons of the colonial project, that even the most stridently anti-colonial screeds are still filtered through the discourse of the colonizers. There is now a considerable concentration of indigenously-fashioned texts dealing with European colonialism on the continent, but outside of the academic bastions, the Western world’s perspective on colonialism remains troublingly insular in scope. Guilt and good intentions can only go so far, and the continued problems in post-independence Africa (and the Congo in particular) are a nagging reminder of the complicity (if not the sole blame) of capitalist democracies in ongoing horrors. This is something that I’ve come up against while working on a lengthy feature piece for PopMatters about the various King Kong films and the powerful nested meanings of the cinematic Kong myth. The filmmaking perspective, and indeed my own critical perspective, is hopelessly “First World” (an abysmal term that I use merely for convenience). The films can be analyzed with this in mind, and indeed have much more to say about the way America operates than they do about the experience of the colonized (little wonder when the colonized are represented by a non-lingual gorilla). But most, if not all, post- and anti-colonial literature that comes out of the West ends up being about the West much more than it is about colonized peoples. Decades of this static discursive position have submerged the moral conundrums of the colonial project. We do live in a time, after all, when a conservative quasi-intellectual (from India, of all places!) can refer to the views of the first African-American President as being those of a “Kenyan anti-colonialist”, and this is considered a bad thing. It’s not that our supposedly enlightened culture has resolved the prevailing problems of colonialism; indeed, not only do we not have the answers, but we’ve forgotten the question. Hochschild closes his book on this theme of forgetting, bemoaning Belgian museums that whitewash the rubber-collecting terror of the Congo and make heroes out of colonial agents who ordered fatal whippings and had their men cut off the hands of children. He’s perhaps too scrupulous a scholar to speculate on the reasons for historical forgetting, but this blogger has no such impediments. Why do we choose to forget the misery and murder of colonialism in not only in the Scramble for Africa but in the earlier conquest of the Americas as well? Because it made, and continues to make, our society of unparalleled wealth and comfort possible, that’s why. Our commodity-driven economy and product-centric culture has been made possible by the deaths of millions in a far-away jungle long ago (and not at all long ago, as the continued demand for coltan, the mineral foundation for most modern consumer electronics, drives continued conflict in the Congo, which is rich in the mineral). Why, I wonder, would anyone want to forget that? Sarcasm, perhaps, is not productive, but then more earnest approaches don’t seem to be either. Moral conscience has often diverted capitalist growth, but never checked it entirely. We cannot perhaps change the economic requirements that drive colonialism, old and new, but we can perhaps be more honest and open about our desires and about their costs. Even that might be taking it too far, though. I hate to echo the pernicious light vs. darkness dichotomy that has dominated the discourse on Africa for so long, but the artificial glow of our civilization seems altogether too comforting to risk stepping back into the colonial shadows from whence it came. Because, as King Leopold’s Ghost makes abundantly clear, our light is that darkness.